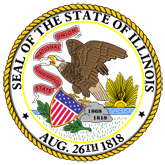 Feature articles cover the Virtual Illinois Catalog (VIC), Illinois Government Information (IGI), Illinois Library Advocacy Day, revisions to the ILLINET Interlibrary Loan Code, and library grants awarded by Secretary White. 1. White awards $7.5 million in grants; Interlibrary Loan Code Revised; What My Library Means to Me (insight_030400.pdf).